Kylie grew up in Edmond and received her undergraduate degree from Southern Nazarene University, where she competed as a Pole Vaulter for the Women's Track Team. She also represented SNU as a member of Oklahoma Intercollegiate Legislature and interned at the Oklahoma State Senate. Kylie received her law degree from the University of Oklahoma in 2015. While at OU she spent two years as Secretary and one year as President of the Legal Group for Building Tolerance and Acceptance, a student organization that helped draft an Amicus Brief filed in the United States Supreme Court in Obergefell v. Hodge, 135 S. Ct 1732-2015. She also participated in the first year of the State Department’s Diplomacy Lab program, analyzing criminal justice reform actions in Yemen and recommending policies that would be successful for the State Department to implement. 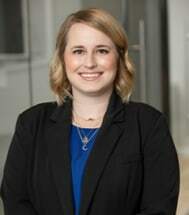 Kylie spent four years (during and following law school) at the City of Oklahoma City Municipal Counselor’s Office in the Civil Litigation Division. She primarily worked on issues related to the Governmental Tort Claims Act and related litigation, as well as §1983 Civil Rights cases and First Amendment issues.